A traditional "help wanted” ad for Methodist ministry would list at least 15 different responsibilities in a pastor's job description. Outlined in The Book of Discipline, they include spiritual leader, worship leader, preacher, teacher, administrative leader and steward of the vision. Rev. Kathy Nolasco, who will become an ordained deacon at Annual Conference 2013, has been using her musical talents at Plantation UMC. Photo from Kathy Nolasco. That means the ideal candidate needs social and personal skills with counseling and organizational management, scholarship, financial management, community public relations and careful stewardship of often scarce resources, just to name a few. The 24/7 on-call nature of the job and the modest salary schedule generally would not be listed as perks. And that’s just the beginning of challenges faced by the seven candidates who will be ordained this year during Annual Conference. For them, full-time ministry isn’t about answering an ad for a full-time job; it is about answering God’s call to serve. “We can’t do church like we’ve done church in the past,” says Rev. David Dodge, executive director of the Center for Clergy Excellence, which oversees the ordination candidacy process for the Florida Conference. “We no longer just open our doors and say ‘ya’ll come’ and expect the people to show up. Now ministry means going out into the community. 7 p.m. Friday, June 14, at The Lakeland Center's Youkey Theater. That’s good news for candidate Kathy Nolasco, who predicts that a career in The United Methodist Church will be vastly different in the coming decades. With a grandfather and uncle as ordained Methodist ministers, Rev. Nolasco grew up in the church in Davie and had already begun an informal ministry of service through mission trips during high school and college. “God worked in my heart on mission trips, teaching me how much God loves all His people,” Nolasco says. Nolasco will be ordained as a deacon appointed to Plantation UMC, where she has been serving as associate pastor since 2009. “In my ministry setting, I have the privilege of directing the adult choir, the children’s and youth choirs, and planning worship, in addition to other pastoral duties,” she says. Rev. 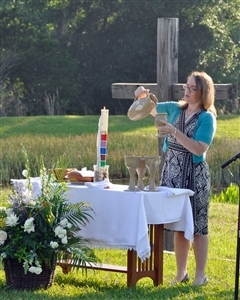 Sarah Campbell, shown here at an Easter sunrise service, will become senior pastor at Inverness UMC after her ordination as elder. Photo from Sarah Campbell. For ordinand Sarah Campbell, the process of discernment about the call to ministry was much different, though the resulting answer was the same. Born and raised in Cedar Key, Rev. Campbell did not grow up in the church. But the sudden loss of her father in her senior year of high school provided the opportunity for her to experience God’s love in the midst of crisis. 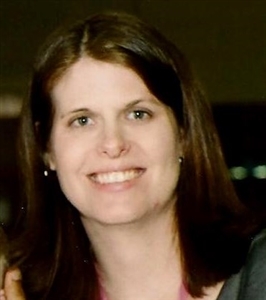 She had attended church only occasionally with her grandmother, but the “church family” of the local Methodist congregation surrounded Sarah and her mom and sisters and comforted them through their grief. “The pastor in particular was very understanding, and he let me be an angry teenager and he let me ask questions,” Campbell says. She declared her candidacy in 2002 and began following the institutional steps outlined in "The Book of Discipline." She explored becoming a chaplain, Christian counselor or youth pastor before accepting an appointment as associate pastor of Harvest UMC near Bradenton. After her ordination as an elder this Friday, she will become senior pastor at Inverness UMC. “My commissioning was the most powerfully profound moment in my life, so for ordination, I expect to be excited, anxious, overwhelmed and happy – all at the same time. In addition to Nolasco and Campbell, the Center for Clergy Excellence lists the following to be ordained as elders Friday: Andrew P. Dancey and Jaime A. Faberlle of the East Central District; Edward A. Kellum, South West District; Nancy R. Mayeux, Gulf Central District; and Audrey B. Warren, South East District. So You Think You Can Minister? • Inform your minister and family of the desire to seek candidacy. • Explore your calling through church resources, including books and workshops. • Make a written application for candidacy to a district superintendent of The United Methodist Church. • Receive official approval of your candidacy from your home church, usually at charge conference. • Fulfill the mandates for certification of your candidacy, including psychological assessment, criminal background check and personal financial review. • Complete the Candidacy for Provisional Membership and Commissioning in The United Methodist Church, which means meeting the educational requirements for ordination. • Decide whether you wish to serve as deacon or elder, which are the official titles of ordained ministry and provide for different paths of service. With schooling and mandatory periods of review, it is not uncommon for the candidacy process to average about 10 years. -- Colleen Hart is a freelance writer based in Cocoa.